My favourite of all is KORA Organics luxurious rose hip oil which is a powerful treatment oil combining noni extract, organic rose hip, jasmine, rose and pomegranate oils. This luxurious oil is packed with a rich source of anti-oxidants and essential fatty acids for the skin that assist in counteracting the drying effects of sun exposure and other environmental influences that lead to signs of ageing and age related skin damage. I apply KORA's luxurious rose hip oil nightly in conjunction with their skincare and wake up every morning with glowing, healthy skin! It is a product that I have recommended to all my family and friends and they too have noticed the remarkable results of having beautiful skin. NATIO's antioxidant lip shine is a product that I've only recently discovered and I'm now obsessed with all the different flavours and shades that it comes in. If your after a lipgloss that leaves your lips feeling moisturised and subtle, but also gives your lips a noticeable glow, then I highly recommend you try this product. I have quite fine hair, so I started using Silk's Oil of Morocco when other hair products I tried failed to give my hair a more "fuller" look. After just one month of using Silk's Oil of Morocco I noticed a significant different in the thickness of my hair and its volume. I recommend this product for anyone who has suffered from hair loss due to stress or other reasons and notice the difference for yourself. RMS Beauty's Lip 2 Cheek is a great product to carry around with you in your cosmetics bag and offers you an organic and natural alternative to other cosmetic products on the market today. Did you know that 98% of all beauty products contain one or more ingredients that have never been publicly assessed for safety? That's a scary thought. Finally, last but not least, (i'm so cliche`) is Banaban's FIJI extra virgin coconut oil. Coconut oil is a great soothing body oil that can be applied after showering as a protective layer for the skin to feed on during the night as your body restores and repairs itself. Not only is it a great body oil, but it can also be used in your cooking! it's a better than butter alternative, is rich in lauric acid and contains no trans fats. 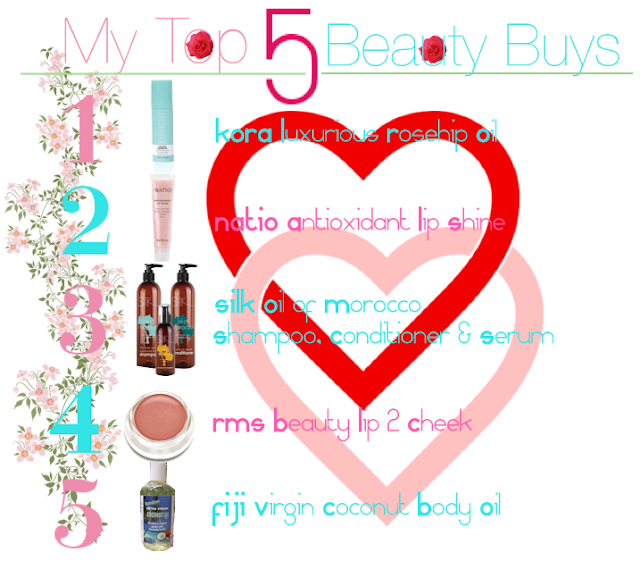 So there are my top five beauty buys that I swear by! Give them a try and tell me what you think in the comments below, or tell us some of your favourite beauty buys!